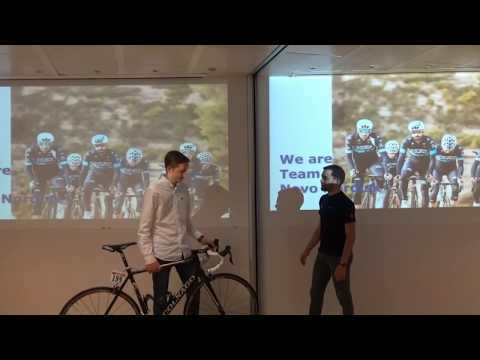 Madrid, Spain – On March 2, Team Novo Nordisk proudly presented 16-year-old Miguel Ceballos with a Team Novo Nordisk Colnago CLX at a special event at Novo Nordisk’s Spanish headquarters in Madrid. Miguel, who was diagnosed with diabetes in 2006 and lives in Santander on Spain’s north coast, was randomly selected from over 10,000 participants as the lucky winner a 2017 Team Novo Nordisk competition to win one of the Colnago bikes the team raced with in 2017. Team Novo Nordisk ambassador Brais Dacal joined the Novo Nordisk staff and members of the Spanish Diabetes Federation to welcome Miguel and his family and present him with his prize. Below, Brais shares his experience from the day. “Miguel couldn’t believe how beautiful the Colnago CLX was when he saw it! He was really excited and it seemed like he wanted to ride it back home already. He was able to learn more about Team Novo Nordisk as well. Now he feels empowered to chase his dreams and he’s excited at the chance of attending one of the team’s Talent ID Camps. That’s the best reward to our mission. It was great to meet the staff at Novo Nordisk’s Spanish headquarters and talk with them about the Team. They are all part of Team Novo Nordisk as well, so it was fantastic to see all of them supporting our mission. They’re a fantastic group of people! I believe that contests like the one to win a Colnago help Team Novo Nordisk build a stronger community along with our followers. They all know now that the Team is reaching out to engage them. They’re our main source of strength and empowerment, and raffling a top-notch bike is a great way to thank them for their support. For Team Novo Nordisk, cycling is much more than a sport. It’s important that children, adolescents and all people with diabetes are aware that they can fight to make their dreams come true and live a successful life. Team Novo Nordisk ran our WIN A COLNAGO TEAM BIKE – DETAILS & OFFICIAL RULES from May 1, 2017 to September 30, 2017. Participants were encouraged to visit the TNN website to enter their details to register, and the winner selection was conducted at random by Team Novo Nordisk from all eligible entries. According to the 2017 IDF Diabetes Atlas1, there are more than 4 million (one in every 9) people in Spain living with diabetes, making Spain the fifth largest country for diabetes in the world. "Each pedal stroke is a message of hope for people affected with diabetes. Our message is that with it you can get as far as your dreams want."